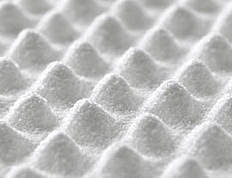 "Cullus is a scientifically developed material and works on a principle that is equally simple and genial: just like a carton of eggs, its surface ”tricks the sound” - diffusing it and further enhancing the natural absorption properties of the material itself. Cullus is knitted material made of Trevira CS, a flame-retardant polyester yarn. It is flexible and is developed to work well with common building materials such as concrete, stone, iron, glass and wooden materials."